Congratulations to our Members of the Week, Rebecca, Lillian and Abigail, who were visiting with Rebecca’s sister, Katherine! We met Rebecca and her family soon after they re-entered the exhibit area to take another look at the Jelly Exhibit in the Aquarium’s West Wing. Rebecca said the family just joined in the summer because her two daughters “love the Aquarium.” Abigail and Lillian could barely take their eyes off of the moon jellies tank and because of their membership they’ll be able to enjoy them all year. 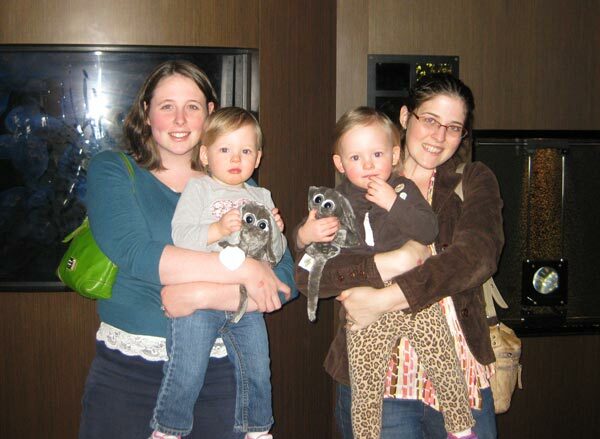 For being our Members of the Week, Rebecca and her daughters received a free 4”x6” photo from our friends at SharpShooter, a copy of the beautifully illustrated Aquarium souvenir guidebook, a turtle shell glass paperweight handcrafted by artist Robin Lehman, and plush stingrays for both Abigail and Lillian!